The Port of Seattle is in the business of moving people. Read below for the best tips for holiday travel this season. Whether you are staying local and hosting visitors or leaving town for that sunny getaway; here you can learn how best to navigate the airport during this busy time of year. 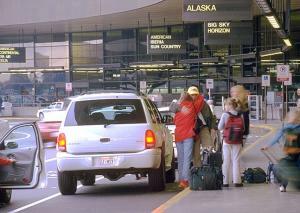 Pickup on the departures drive-- Airport traffic increases in the evening at Sea-Tac due to many inbound flights which creates traffic congestion on the Arrivals Drive. Instead of meeting your party outside of baggage claim on the Arrivals Drive, suggest that your arriving guests take an escalator or elevator from baggage claim to the ticketing level of the terminal and meet you outside the less-crowded Departures Drive. Don’t get stuck in traffic!-- Park on the Terminal Direct floor of the airport parking garage, the quickest and most convenient option for meeting passengers in the terminal, and pay just $4 per hour. Try the cell phone waiting lot -- Parking in this lot is free and drivers can wait up to 30 minutes until arriving passengers have deplaned, collected luggage and called to be picked up outside of Baggage Claim. Take advantage of the cell phone parking lot and the new QR code that you can scan for the most recent flight arrival information. Remember, there is no parking or waiting allowed on the airport roadway shoulders. Pack with security in mind – Know what is and isn’t allowed in carry-ons and checked luggage by checking the TSA website. Remember, no wrapped presents! Also see if you qualify for the new TSA PreCheck program. 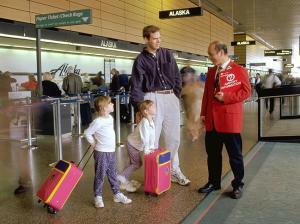 Park in the Sea-Tac Airport garage – Save time, stay dry and be close. No shuttles, covered skybridges and you are right next to the terminal.